The ribbons of steel that made up the Kettle Valley Railway are gone. All that is left are 16 km (9.9 mi.) of track, the odd station house and out buildings, a few relics and the history. The Kettle Valley Railway was the tie that bound the Kootenays to the rest of British Columbia. The Kettle Valley Railway started at Hope and went all the way to Midway, zigzagging throughout the south western sections of B.C. From Hope, the KVR made its way through the Coquihalla River gorge. It continued onward to Princeton, West Summerland, Penticton, along the south side of Okanagan Lake and finally south to Midway, for a total of 525 km (325 mi.). They constructed branch lines to Merritt and to Osoyoos, making the line complete. In the year 1887, silver ore was discovered in the Kootenays. Soon American miners were taking over this corner of British Columbia and the money flowed south of the border. This became a political issue, which would elect or defeat future provincial governments. The two remaining railway giants, the Canadian Pacific Railway, and the Great Northern Railway, an American railway would be vying for the control of the rail transport from the Kootenays. Starting in the year 1893 and continuing for many years, these two feuding railways constructed short railways connecting towns that were springing up in this region of B.C. 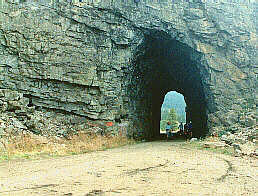 In 1896 the surveying of the Crowsnest Pass started and the CPR line into the Kootenays was finished in the year 1898. By 1900 the first CPR rolled into Midway. The CPR now had a railway into the Kootenays from the east, but still no connection to the west coast. In 1910 the construction of the Kettle Valley Railway started. The hardships were many, and construction costs were high. Andrew McCullogh was the chief engineer and nothing would stand in his way of completing this railway. Against all the hardships, the Kettle Valley Railway was finished on July 31, 1916. For the first time there was daily passenger and freight service from Vancouver to Nelson. The KVR started its downward slide in 1949 when Highway # 3 (the Hope Princeton) opened. During the next few years, obviously to keep the KVR running was no longer feasible. In 1962 they removed the Coquihalla section of tracks. In January of 1964 the last passenger train ran from Merritt to Penticton and onto Midway and finally Nelson. The Kettle Valley Railway was closed. Andrew McCulloch, was not only a brilliant engineer but he had a real passion for Shakespeare, and the stations along the Coquihalla section were named after characters from his plays. Station names such as Juliet, Romeo, Lear and Othello are found between Hope and Brodie. From Brookmere to Princeton stations and interesting hiking came be found at Spearing, Thalia, Manning, Tulameen, and Coalmont. The next section of the KVR is from Princeton to Penticton with sites such as Belfort, Erris, Osprey Lake, Thirsk, West Summerland and Winslow. Penticton to Midway, the last section includes stops like Chute Lake, Ruth, Myra, McCulloch, Lakevale, Breaverdell, Westbridge, Rock Creek and finally the end of the line. The only remaining track is a section 16 km (9.9 mi.) long found west of Penticton, but people are returning to the KVR. People hike, mountain bike, four by four and horseback along the rail bed and the Kettle Valley Railway is making a comeback. Just a few miles east of Hope is Othello where the Quintette tunnels are part of an official park with entrances from both the north and south. To reach the tunnels from the north end, take the Kawkawa Lake Road from Hope and go east about four miles, watch for the Quintette Tunnels sign. Park and walk the rest of the way to the tunnels. To reach the south entrance, walk the old KVR right of way. Take the Kawkawa Lake Road to the cemetery, turn right and make your way to the intersection of gravel roads. Park your vehicle and hike to the tunnels. The hike into the Quintette is an easy trek that the whole family can enjoy. From Hope to Brodie the Coquihalla Highway makes its way along much of the same route as the KVR. In some spots one can see the old rail bed and sometimes even hike into these sites. The information sign at Coquihalla Lakes offers a short history about the Coquihalla pass that ranchers used for cattle drives as early as 1875. At the Coldwater River crossing is a picnic site, and near the iron bridge the information sign tells about the work that Chief Engineer, Andrew McCulloch, accomplished. Brookmere was once a divisional point for both the KVR and the VV & E ( part of the American Great Northern). Both railroads build a round house and a turntable. Both shared the water tower and the station house. The water tower still stands. Some KVR rail remains and the GN station house is a private home. Coal from the Tulameen Valley was used to run locomotives on both railways. 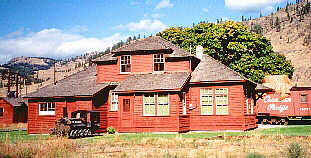 The once thriving and booming coal town of Tulameen is now a ghost town and the KVR station house is now a private home. Coalmont, south of Tulameen, is still another town from the past. The Coalmont Hotel and a few false front buildings are all that are left. Next is Princeton, where a loop of track that served as a train turnaround and a tunnel are all that remain of the KVR. An old CPR caboose serves as a tourist information centre in Princeton, giving us a glimpse into the past. The section of the KVR that once ran from Princeton to Penticton, also made its way into the Okanagan Valley. The most interesting site along this section of railway is the Trout Creek Bridge, the highest bridge on the KVR. Located west of Summerland the span is 188 meters (616.6 ft.) long and 73 meters (235.4 ft.) high. View this bridge is from the Agricultural Research Station at Summerland, just off Highway 97 near Sunoka Beach. For your protection there is a chain-link fence that guards the edge of this awesome canyon. Penticton was the KVR Headquarters where they built repair and service facilities. In October 1912, the first locomotive arrived in town and everyone celebrated. In 1915, when the line was finished from Merritt through to Midway, they held another celebration when the first passenger trains came in from both the east and west. The Penticton station is no longer in use, and the KVR right-of-way are now footpaths across the city squares. The Kettle Valley Railway from Penticton made its way to Naramata, and onto Arawana. A couple of roads offer good access to the railway line for the many people who like to walk this section. Next stop was the Glenfir station, which is approximately nine km (5.5 mi.) north of Penticton. Not far from Glenfir is Rockovens Park and an old growth stand of pine trees. A marked trail leads to the site of the one and only surviving oven that they make from stones. This is a steep climb. At Adra, walk through the long tunnel or bypass it by climbing up through Rockovens Park, where there are magnificent views of Okanagan Lake. A good place for a base camp is Chute Lake, from here your can hike both directions and enjoy the few relics that remain of the Kettle Valley Railway. Myra Canyon is spectacular. 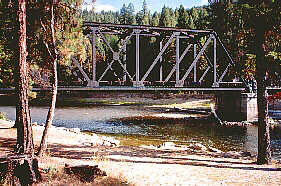 Sixteen trestle bridges cross along this 13 km ( 8 mi.) stretch of railroad. This is an ideal hike, especially in the spring or fall. This section of the KVR is the best example of railway construction of the early twentieth century. The trestles here are in good condition. They have renewed most with treated timber. Be very careful when walking across any of the trestles and before starting, pay attention to the height, as one little slip could mean a life. Access Myra Canyon, from the top of Chute Lake Road, from a forestry road south of Kelowna, or take Highway 33 and go in on the McCulloch Road past McCulloch Lake Resort. From McCulloch station the KVR curves south, this section is good hiking, but be careful of the many washouts. Cookson, is marked by a red freight shed. The Lakevale station site is now a Forestry camp site. Between the stations of Lakevale and Lois is a hiking or 4 by 4 trail. The only thing surviving at Lois is a red freight shed. Carmi was once a booming town with a gold mine, a jail, a hospital, two hotels, two stores and gas stations. It is now a ghost town. In Beaverdell is an old hotel (the oldest in B.C. is the claim) where outside stands a KVR railway signal. At Rock Creek, the KVR, now a road, runs through the centre of the village. Midway is the half way point across British Columbia and where the Kettle Valley Railway joined the Canadian Pacific Railway that continued to Alberta and onto eastern Canada. The museum at Midway has a CPR caboose and a section of track. KVR right of way is found under the highway bridge and follows the Kettle Valley River as it makes its way to the U.S. The Kettle Valley Railway is now just part of history. With more people finding time for outdoor fun and enjoyment, it seems only natural that the old KVR railbed is becoming very popular with hikers, mountain bikers, and horseback riders. Now only parts of the KVR are open to the public, but interested parties are working on making the full railway available for recreational use. No matter where hiking in British Columbia be safe, have fun!